At age five, I was given an adult-size Italian grip fencing foil and was drilled over and over again in four basic moves whose repetition is engraved in my memory: "en garde; disengage; thrust; lunge". I was even scrawnier then than I am now, and the foil got very heavy very fast, but I was not allowed to just stop. I had to tap the tip of the foil three times on the ground in a made-up ritual to signal that I was tired and wanted to stop, and maybe, maybe my dad would let me rest. My dad had a thing about broadly educating his daughters - my sister and me. And, to be fair, he was mostly a very enthusiastic teacher, exposing us to brain slides under his microscope, regular visits to the Natural History Museum and Planetarium, learning to skin dive, and of course, fencing. Fast forward to my senior year in college, when I'd been dealing with Crohn's disease since age 18. I'd deferred graduation to take a bunch of science courses so that I could become a physical therapist because, according to my dad, that was what the up-and-coming profession was going to be. (Ok, he was right.) But I got sick. My joints swelled up, I lost weight, and just getting from one class to another because exhausting. When I showed up in the library one Friday afternoon for my work-study, I was feverish, panting (anemic) and my joints were red and hot, Knees and elbows large as grapefruits; my boss took one look at me and begged me to go home, tell my Dad I was done, and just take my degree in English Lit as planned. That weekend, with great dread, I made the announcement. I had to thrust my hot, swollen elbow under his nose to convince him that I was sick, and still, my father yelled at me that I was failing. 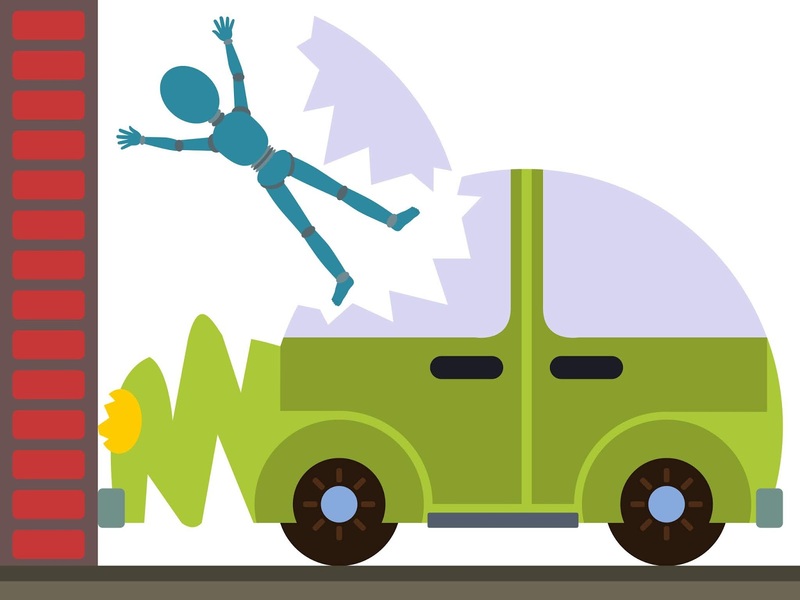 When stopping in reasonable time isn't an option, the only alternative is to crash. It's not just my dad who suffered from a terror of letting go and yielding. Our culture embodies a drive towards endless growth and productivity. We measure ourselves relentlessly by our work, and are collectively terrified of not measuring up. And we talk of illness in the language of war and battles. In this kind of environment, any retreat is seen as failure. Is it any wonder we are so ill, addicted, exhausted, and injured? This summer, after recovering from a fire which consumed the building where my Pilates studio was, I felt exhausted and down-hearted. I was tired of picking up the pieces and going forward. I'd done it a few years before when I was diagnosed with breast cancer. I'd worked all through chemo and rushed to pick up the reins after surgery. God forbid I stop. Same with the fire. Within a month I was up and running again, my insurance adjustor remarking how "proactive" I was. But deep down, I longed to tap three times and be given permission to stop. And then, July 2, I blew a disc in my studio, while preparing for the day. Next thing I knew I was on the floor writhing in pain, sobbing. And still, I worked for the next four hours. When you're used to pushing through pain, the word "stop" takes more than a few beats to get through. It's like having bad brakes. You need a longer distance until the car finally stops. It may, on the face of it, seem heroic, this impulse to keep going. It's not. It's a bad habit, and limiting. Possibly, it speaks of a lack of imagination, as if stopping were inconceivable. My God! What would you do if you had to stop? L5-S1 Disc extrusion: see blob that sticks out in the white space? That's the nerve the disc is pressing on. OUCH!!! The sad part is wondering how many of us feel that only drastic pain justifies stopping. Sadder still, economic necessity may drive us past endurance. That has certainly been one of the drivers in my life. The fear of being homeless, extreme as that may seem, is not completely irrational. In the depth of my heart, some part of me longed for something that would enable me to stop. The fire didn't do it. 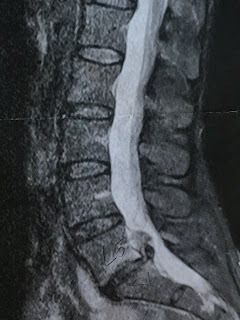 Sometimes I can't help wondering if the Law of Attraction, working to match my vibration of longing to stop with what would actually enable me to stop, resulted in this: a mechanical failure of my back - 'cuz cancer didn't do it, by the way. In the meditation tradition I've been working in, all circumstances are brought onto the path. One is invited to see events as a mirror, as instruction or guidance. 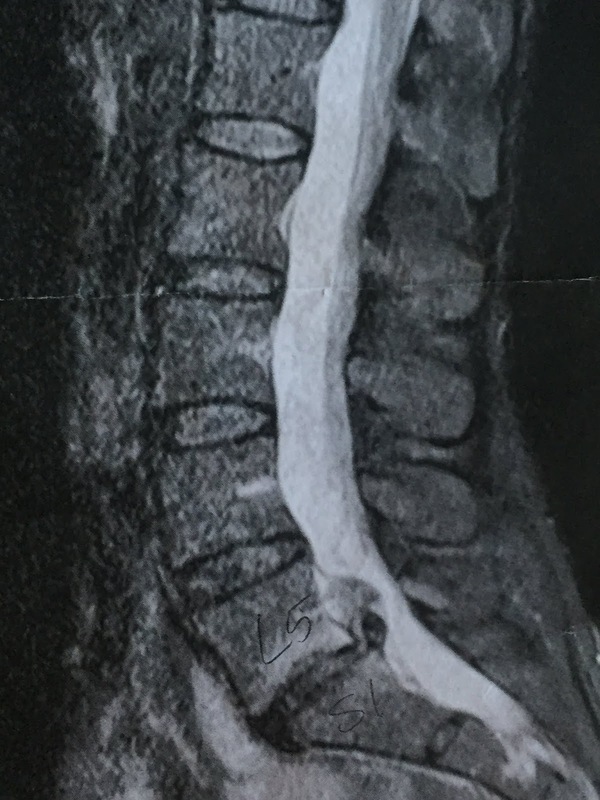 Whatever we call "God" is present in each and every being, thing, place, or event; God is showing up as This: in my case, a busted disc and the necessity of a surgical repair. An upshot of having to stop is an opportunity to pause, look around, and simply take stock. Time flows differently. The task at hand becomes simple: do nothing so you can heal. (Of course, healing is something, but it's something your body does best without a lot of active interference from you. In fact, the less you do, the more you allow, the better. Or so I've found.) Another aspect of stopping is allowing people to take care of you. As difficult as it may be to admit, our lives are often bookended by being the receivers of great care. What if, along the way, we remembered how sweet it is to receive? How humbling it is to find even simple tasks difficult if not impossible. It's good to remember that our vulnerability is one deft blow away. Mastery and authority in dance do not necessarily come as a result of perfection, or even consistent flawless execution, but from the confidence built by thousands of hours of practice in which exploration and discovery trump tension-inducing performance anxiety. For most dancers, the bulk of this practice takes place in ballet classes. But I want to talk about the importance of practicing alone, without the eyes of a teacher or your colleagues on you - both can be inhibitng. Mastery doesn't come from not making mistakes but from having the freedom to explore. When I was 12, my first ballet teacher gave me the keys to her school - The Ballet Studio. She'd known me for some 5 years and saw I was completely dedicated and obsessed with ballet. I was desperate to practice, and had no room at home to do so, though at night while I was supposed to be in bed, I was using my dresser for a barre. Sundays, when there were no classes, I was driven to the studio by one of my parents, let myself in, locked the door, and gave myself a ballet class for two hours. Just now I realize how extraordinary this situation was. Giving keys to a 12 year old, allowing her to be alone in a studio, trusting her - this was a great gift from my teacher. In those hours, I worked, puzzled, studied my line, steps, arms, turns, jumps. I invented choreography, cried, raged, and celebrated. I noodled, working to try to understand how classical ballet technique could be applied by my body. This experience taught me that working by oneself is essential. Unconstrained by time, by the need to do certain sequences as given, you can surrender to a process that is completely organic and directed from within. Guided by curiosity, desire, frustration, determination, and the hunger to "get it right" working alone gives freedom to explore in whatever way is necessary, not dictated by the conventions or time constraints of a traditional class, or by whatever dogmatism may be driving your teachers. Imagination serves inquiry and can be used to invent exercises that facilitate kinaesthetic understanding or liberate the body from the tension born of expectations. Shame flees and is replaced by curiosity and discovery. At eighteen, I became catastrophically ill and was told to ive up dancing. It was heartbreaking. It took nine years before a life-saving surgery changed that fate. I went back to my old studio. Though my teacher had died, one of her students had taken over. I was so weak, I could barely get through barre. That's when someone told me about Pilates. A year later, I had a tiny studio built in my basement, put a barre, mirrors, and a reformer there, creating a studio sanctuary. I practiced there many hours, and also took classes wherever I could. Within another year, I was performing at the Met Opera in NYC. Now in my own Pilates studio in Portland, OR, working by myself is my principal practice outside of teaching. I use this practice to problem solve in my own body, and to help me understand the problems of clients and students. I experiment with exercises, stretches, different planes of movement, changing resistance, gravity, intent. Essentially, the studio becomes a laboratory where the purpose is investigation, not the accomplishment of perfection or some pre decided outcome. This freedom is precisely what drives private sessions. Here, in conjunction with clients or students, I allow their process, their needs, to move them, and together, we explore. I also encourage everyone to go home and work alone. Solitude is the mother of creativity, the incubator of discovery, and the cradle of understanding. Noodling is essential to success. Life expectancy in the US is 76 for men and 81 for women, up eight years since the ’70s, according to recent statistics. In recent years my practice with elders has doubled. 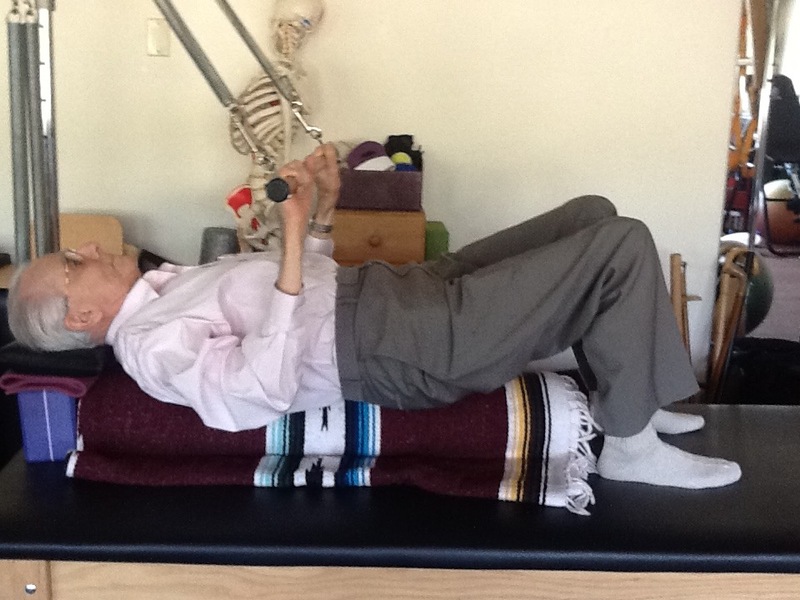 I call "elders" people 80 and above, of which I have four clients: My 91 year old clients began working with me when they were in their late eighties, about four years ago, never having experienced either Pilates or yoga. 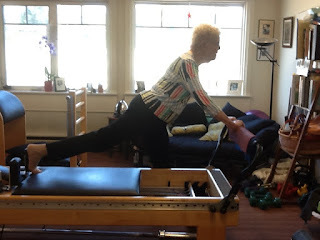 An 82 year old woman has been doing Pilates with me for six years beginning in her seventies, while another client who is 89 began in her mid-eighties. This is a brief overview of issues that have come up and not intended to cover specific exercises and practices. Further, I see each of these clients individually and not as a group. Most come weekly. I have come to appreciate their challenges and strengths. 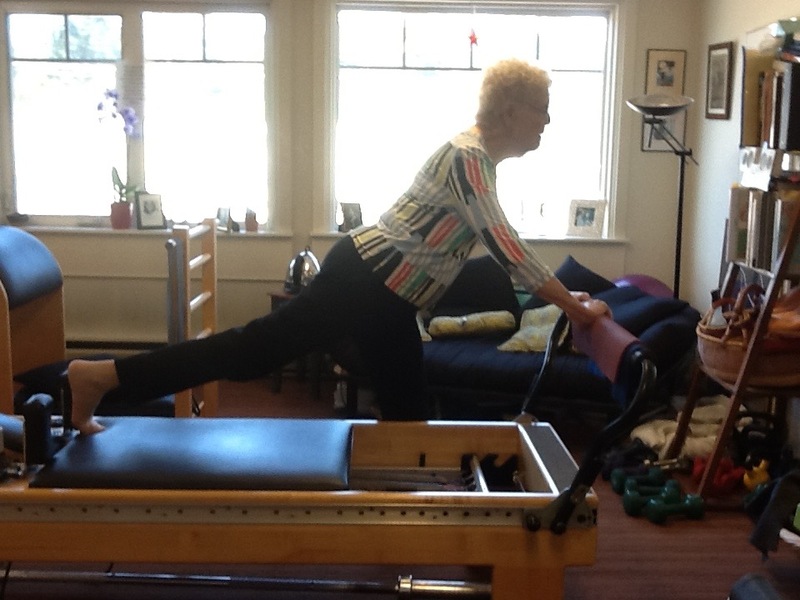 What makes Pilates unique and successful with elder clients? How can we make the best use of our sessions to serve this demographic, and what needs must we be made more aware of? It’s crucial to remember that each person is unique. A WWII veteran, pilot, and architect, 91, has severe scoliosis, a chronic sore left foot he favors, and very poor vision. These factors compromise his balance, stability, and mobility. His head tilts to the right 20-30 degrees unless he is thinking about sitting/standing up straight. He also wears hearing aids. Yet his attitude and mind are spry and engaged, and his ability to visualize his body as a three-dimensional moving structure puts him way ahead of the game. One client, though not as compromised with spinal restrictions other than arthritis, has poorer hearing and is less outgoing. These factors alone radically alter the feel of our sessions and make it more challenging to keep her engaged. Another has been a life-long gardener and continues take care of her garden. Physically she is the fittest of the three. Her fitness means that she can get down on the floor and get up again with agility and no mishap. Being able to get up from a prone or supine position is one of the most important skills we can teach. Here are other challenges and things to bear in mind when working with this demographic. To help us remember, the first six points are alphabetically listed. Arthritis/Agility: in hands it affects ability to hold things like straps and weights. in feet, it compromises stance and balance. I begin most sessions with a spiky ball, rolling under feet and between hands to help warm up the joints. Some clients will not be able to get down to the floor, or even on all fours on the table. Finding ways to subtly alter planes of movement is essential. Balance and Benign Paroxysmal Positional Vertigo (BPPV): the chance of developing vertigo increases with age, especially after age 60. Practicing the Brandt-Daroff exercises or the Epley Maneuver with them on the Cadillac can be an important part of their session. None of my elder clients is comfortable with supine back extension. Coordination and comfort: extra padding for bony backs and knees, making sure clients are comfortable and cared for throughout your sessions enables both them and you to concentrate on the work. Elders often rely on the familiarity of their routines and movement patterns to compensate for compromised function. Our job is to challenge and expand their capacity, but in an environment where they feel safe and comfortable. Deafness: even with the best hearings aids, you have to speak clearly. What appears as lack of focus is frequently the result of just not hearing. I find myself doing the flight attendant thing, making gestures to accompany my words, and making sure they can see my face so they can read my lips. Energy: they tire more easily. Observing their color, breath (or lack of it) and demeanor will tell you if you’re going too fast. Pacing that requires pauses for rest and assimilation can be a real gift. They are more variable as well. A poor night of no sleep or a tiring previous day, and their capacity is very much affected. Ask how they are, how they feel, before you begin and as you move through the session so you can improvise accordingly. Rigidity/Parkinsons: lack of over-all mobility and coordination makes transitioning from one position to another difficult. Don’t take these transitions for granted. Talking through how to get up or lie down more efficiently is necessary and can be a teaching moment for both of you. For example, observing an inability to bend knees into chest can clue you into working on hip flexor strength and flexibility. Stretching is an essential part of every session. Finally, knowing what we may and may not improve through our work with elders is important. With my scoliotic pilot, I will not be able to erase a lifetime of scoliosis. But I can keep him from deteriorating as rapidly as he might without Pilates. Slowing degeneration IS progress. Let’s face it - the body will continue to age, but it can do so with less stress and debility. Many elders are more isolated, less stimulated, and so less engaged than younger members of society. Don’t underestimate the impact your relating has. This may be the one day they get out - only two of these elders drive. Pauses in sessions can be moments of connection. Ask them about their lives. This can be rich and fulfilling for both of you. They’ve lived almost a century - their experience is valuable but under-valued in our culture. When I work with elders, I feel honored to host them. It’s a joy to help make their experience a safe adventure in conscious and embodied movement. I’ve learned to trust my intuition and imagination as I explore ways of better expressing movement instructions and create sessions that are nourishing, educative, and restorative. They have taught me to savor time and relish physical capacity in any way it shows up. I am a better teacher thanks to our interactions.